As regular readers of my blog know, I love learning new things. As a teacher, I think it’s important to continually put myself in the position of a learner so that I never forget what it’s like to sit on the other side of the table. I recently set myself the challenge of learning braille. 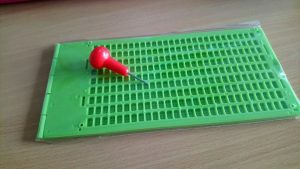 A friend of mine and her mum are braille teachers and I asked them to teach me As I don’t see them often I said I would teach myself some of the basics first so that they could then teach me the more complex parts, and I promised to write my friend a letter in braille when I had managed to learn some. I’m really glad I decided to do this, as I have learn so much more than just a new way of writing the alphabet. First of all I downloaded a fantastic app called Braille Tutor and started learning the alphabet and numbers. I also used these lovely resources from Twinkl, and these (also from Twinkl), some of which were great from practising the alphabet in context, rather than just a letter at a time. The first thing I realised was that when I first started I was confusing some of the letters for each other. Take a look at these two letters and you’ll notice that they are very similar. The i and the e are mirror images of each other. Now look at these and you’ll notice they are like two sides of a square being rotated anti-clockwise by 90° each time. This gave me a much better understanding of what it must be like to be dyslexic because I mixed up the i with e, and d, f, h and j in a similar way to how people with dyslexia confuse m with w, and b, d, p and q. Even though I knew that these were different letters and that the orientation was important, somehow my brain just kept flipping them over and turning them round. Learning to read braille has reminded me of how much understanding you lose when you have to decode every word instead of reading fluently – I had to keep taking breaks to mentally recap what I had just read. I always encourage weaker readers to pause and consolidate what they have read before moving on, but my experience reading braille has shown me that I actually need to make them do this much more often with smaller chunks of text. Once I was confident with the alphabet and numbers I decided it was time to try writing a letter to my friend. I quickly decided that a braille printer was waaaay outside my budget, and so I bought a slate and stylus from Amazon instead. This was my second lightbulb moment. Anyone who works in education will know the frustration of marking work and finding that there are no capital letters and very few full stops. I wrote a post some time ago about this (Why do they do that?) but I now have some new ideas to explain this…. I knew exactly what I wanted to write, and I sat down to compose my letter. Half-an-hour later and my first three attempts were languishing in the recycling bin. I mentally crossed out most of what I had planned to say, and sat down again to write a very basic note. It took me an hour to write 5 lines, and when I read back over what I had written, I noticed that I had missed quite a few capital letters and some punctuation. Obviously I know how to use capital letters and full stops, so what on earth had gone wrong? The problem was that it’s hard to write braille. You have to remember what the pattern of dots for the letter you want to write is and then you have to reverse it (because with a slate and stylus you work from right to left and mirror write, so that when you turn the paper over the embossed dots are the right way round) – and remember some of those letters are hard to tell apart anyway! You have to make sure that you have placed the stylus in the correct part of the cell and you have to use just the right amount of force – too much and you just poke a hole in the paper; not enough and the indent doesn’t show through clearly enough on the other side. I found I was concentrating so hard on all of this that there was no brain power left for anything else, such as remembering to add in the symbol that means “capitalise the next letter”, and so on a couple of occasions it just slipped my mind. I’m sure it must be like this for many children in our classrooms, and this experience has helped me to understand exactly how much effort goes into writing a simple sentence. Hopefully, it will also help me to think of new ways to help them so that they become able to express what they want to say, instead of limiting themselves to what they feel able to say, and so that their punctuation is accurate more consistently. There’s still so much more I need to learn for braille. I still have the contracted form to tackle- I haven’t even mastered double letters yet so that may take a while. I’m glad I’ve made a start though. It means I can send my friend Nicki letters from time to time instead of only ever communicating by text/email and I’ve improved my teaching practice at the same time.